We recently visited the Brew Bar which was open for business in September. Brew Bar is an initiative of Helen and Asif, the two friends who have turned into business partners. This cute boutique cafe is situated in the premises of the Zen Boutique Hotel in Colombo 07, Rosmead Place. 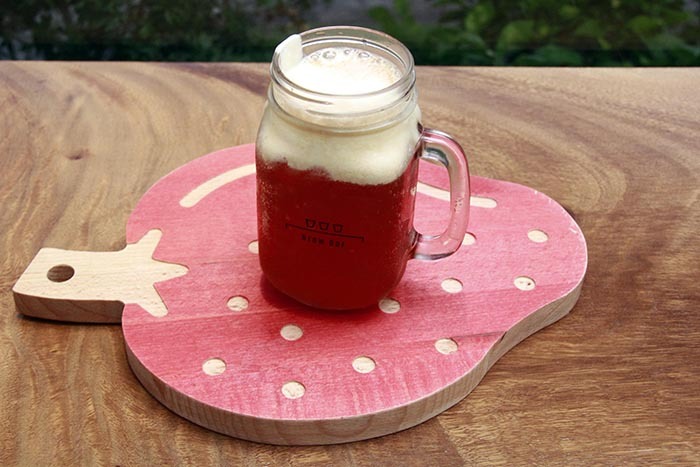 Brew Bar specialises in bubble waffles and cheese tea, two totally new concepts in Sri Lanka. Helen and Asif were happy to explain that the snacks originated from Hong Kong, but have been adopted to tantalise the local taste buds. There are cute quotes and ornaments decorating the space, providing the atmosphere of a chilled-out hangout spot. Though short, the menu looked very creative to us, so we decided to go ahead with the suggestions of the two friends. This bubble waffle belongs to the savoury section of the menu. 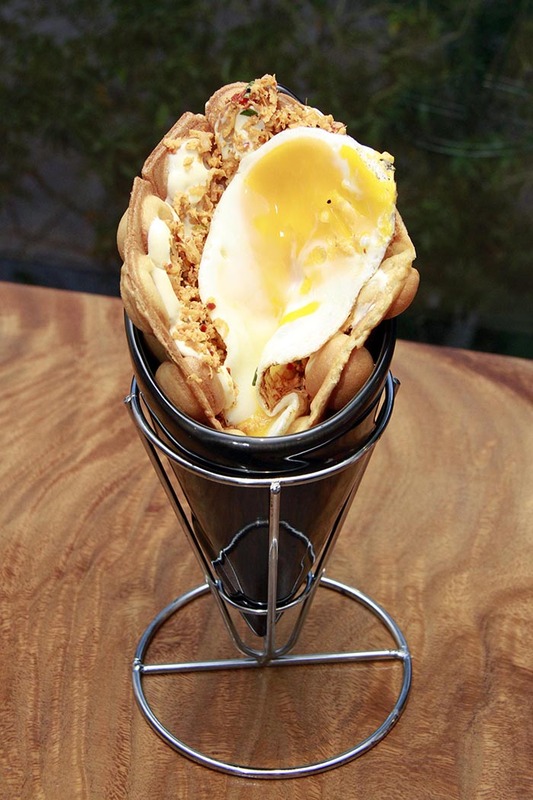 It came with a sunny side up egg and pol sambol on a cheese spread over a normal bubble waffle. The waffle was slightly spicy complementing the pol sambol with a touch of sweetness which came from the waffle. The bubble waffles are a tad different from the waffles we’re used to usually, because they have bubbles on them, which is very exciting if you likes to try out innovative food items. Even though we were told that bubble waffles are a snack, they could pass as a very fulfilling main course! The original bubble waffle is a sweet waffle in the menu. 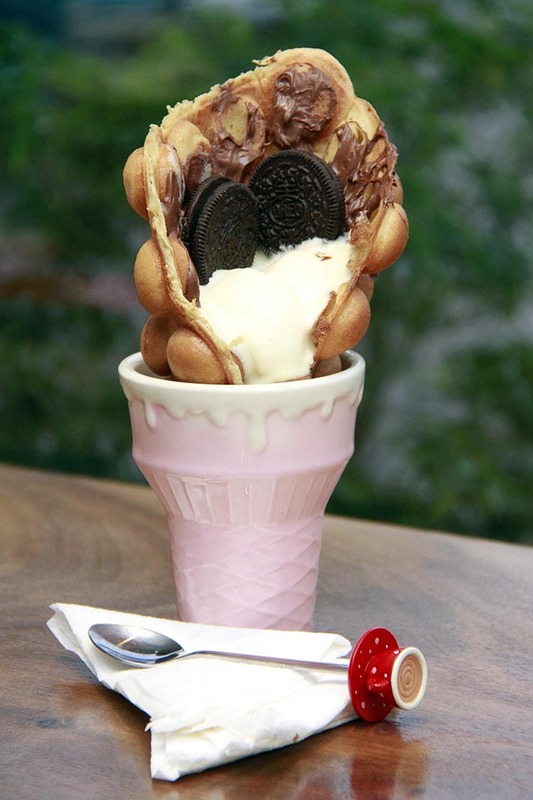 This bubble waffle was chocolate flavoured and came with a scoop of vanilla ice cream, two biscuits of Oreo and a generous amount of Nutella on top and spread on the bubble waffle as well. I was advised to use my hands to enjoy this tasty treat. It was tasty and sweet at the same time. We highly recommend the sweet bubble waffles listed on the menu as great desserts to finish up a meal and could even pass as a main meal if you have a sweet tooth. We decided to go with a lychee flavoured cheese tea. We were very curious as to how this cheese tea would come, because we have never tried something like this before. It came with cheese foam on top which was slightly salty but cheesy. The rest of the drink tasted like the usual lychee iced tea that we get, but the sweetness of the drink was well balanced, giving a great experience to the drinker. For a café which has just started off, they are doing quite an amazing job. Heartiest wishes go out to the management to keep up the good work. Cheers to a good meal! His spirit – a classic example of versatility – comprises the excellent energy of sportsmanship, passion, strong sense of work ethic, and dedication to his craft. Aura, which has a dazzling collection of both ethnic as well as fusion wear, also stocks bags, shoes, and jewellery to complement any outfit.